Italpinas CEO and executive chairman Arch. Romolo V. Nati was chosen to speak at the 19th Fédération Internationale des Administrateurs de Biens Conseils Immobiliers (FIABCI) Asia Pacific Regional Secretariat Summit held recently at the Marriott Hotel Manila last April 17, 2015. With the theme “Cities of the Future: Asia Pacific”, FIABCI-Philippines brought together international and prominent speakers in a program filled with timely information pertaining to global real estate. Speaking before members of the FIABCI community across Asia, Nati talked about the importance of sustainable design in the midst of climate change and the problems plaguing many homeowners in the Philippines. In the real estate industry today, energy efficiency efforts are now becoming an essential component in property developments. “With both a housing deficit and a power shortage problem prevalent in the country, it just makes sense that the future of design is in sustainability. We need buildings that not only look good, but also function well to help alleviate those two problems. This is why green design is important,” stated Nati. Nati also explained one of the biggest misconceptions people have about eco-friendly structures being expensive. “A lot of people don’t realize that green, sustainable design can be done without the staggering costs. We at ITPI practice what is called passive green design, meaning rather than use expensive equipment to make a structure green, we incorporate design elements to help, say, lower the cost of energy,” he explained. “This way we can make the units affordable for the middle class,” he added. 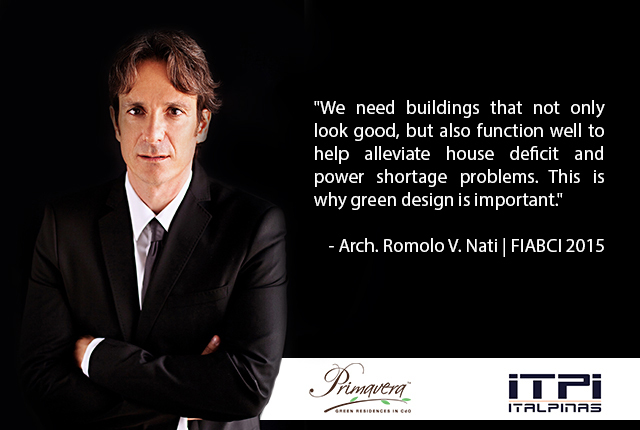 Primavera Residences, ITPI’s flagship development, is a primary example for sustainable development. The 10-storey mid-rise twin tower is a winner of the 2014 Asia Pacific Property Award for Best Mixed-Use Development in the Philippines. Located in Pueblo de Oro Township in CdO, Primavera Residences is modeled after an anthill with a hollow column in the middle of each tower allowing air to enter and circulate, creating a chimney effect that helps cool down the building, lowering air conditioning and electricity costs. “Power is one of the key issues in Mindanao, so it just made sense, especially in that area, to have energy-saving features. This can be seen as a benchmark for energy-efficiency. If we can do it in Cagayan de Oro, we can do it for the rest of the country,” Arch. Nati emphasized. Primavera Residences’ Tower 1 has been completed while its Tower 2 is 90% complete. Do you want to know more about Primavera Residences? You may contact (088) 880-5002 or 0917 794 2221. You may also visit their website by clicking here. Stefan is a graduate of Development Communication with emphasis in Journalism at Xavier University. From being a frustrated writer, he overcame being one and motivated himself to be an inspiration to others by writing noteworthy articles in a local magazine and newspaper. Also a theater actor, Stefan loves art and his creativity moves him to be the best of what he's capable of.